Whether you are full blood orc, or just like epic adventures finding movies like Warcraft should be on your list of things to do! I love a good fantasy film, and the new Warcraft movie has all the elements for a seriously big adventure. Until I can see the new movie, I’ve pulled together a few other epic adventure movies to get us started. Check out some of my picks for movies like warcraft below plus see the new Warcraft trailer! Orc armor is optional. Warcraft is an upcoming epic fantasy film, based on the video game series of the same name by Blizzard Entertainment and will be released in theaters on June 10, 2016. If you haven’t yet seen the trailer, you have to take a peek! Then see all the movies like Warcraft below! Seventh Son is a 2014 3D epic fantasy action movie that is loosely based on the 2004 book The Last Apprentice: Revenge of the Witch by Joseph Delaney. The movie stars Jeff Bridges, Julianne Moore, Ben Barnes, Alicia Vikander, Antje Traue and John DeSantis. The Seventh Son follows the adventures of John Gregory as he seeks to find an apprentice. Jack the Giant Killer is a 2013 fantasy movie that is a modernized version of fairy tales including Jack the Giant Killer and Jack and the Beanstalk. The film stars Ben Cross and Jane March. Jack, the Giant Killer, tells the tale of Jack, who finds himself forced with the task of climbing down his beanstalk in the sky to fight off the evil beasts who want to destroy Earth. Dungeons & Dragons is a 2000 fantasy movie that is based on the video game Dungeons & Dragons. The movie stars Jeremy Irons, Justin Whalin, Marlon Wayans, Thora Birch, Zoe McLellan, Bruce Payne, Lee Arenberg, Richard O’Brien, Kristen Wilson and Tom Baker. Dungeons & Dragons showcases the happenings of Profion, an evil mage, who tries to gain control of The Empire of Izmir, currently headed by Empress Savina. Eragon is a 2006 fantasy adventure movie that is based on the 2002 book of the same name by Christopher Paolini. The film stars Ed Speelers, Jeremy Irons, Robert Carlyle, Garrett Hedlund, John Malkovich, Joss Stone and Sienna Guillory. Eragon is a young farm boy, who discovers a dragon’s egg, and finds himself defending his village of Carvahall against the evil king Galbatorix. The Hobbit: The Desolation of Smaug is a 2013 fantasy adventure movie. This movie is the second installment in the 3-part movie series, with the other two being 2012 The Hobbit: An Unexpected Journey and 2014 The Hobbit: The Battle of the Five Armies. All three movies are part of the Lord Of The Rings movies.The movie stars Martin Freeman, Ian McKellan, Luke Evans, Orlando Bloom and Evangeline Lilly. The Hobbit: The Desolation of Smaug continues the journey of the group of dwarves, Gandalf, and Bilbo, as they try to reclaim their homeland of Erebor. So are you excited about the Warcraft movie? 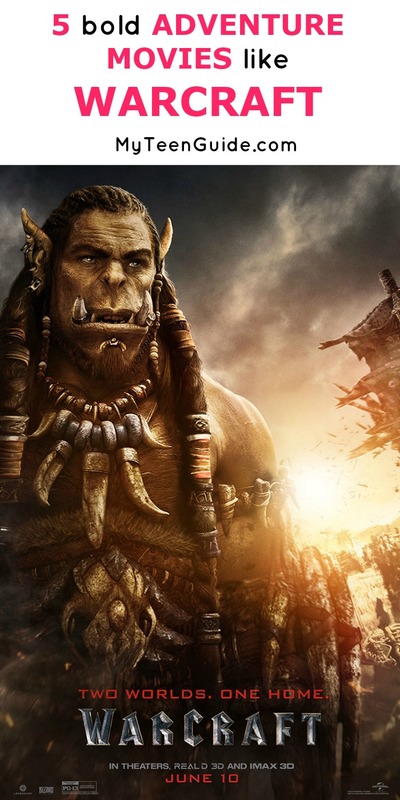 Which of these movies like the Warcraft movie will you add to your watch list? I personally have a movie night with Eragon again! Tell me what you’re watching in the comments!